Cornellà de Llobregat - close to the Barcelona airport, city centre, and World Trade Centre and Exhibition centre. 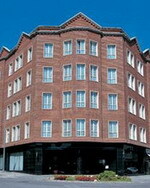 The Campanile Hotel is in an ideal location for business and leisure travellers. 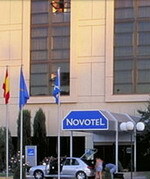 The hotel is nearby the main Exhibition centres in Barcelona. Continental breakfast buffet and traditional English breakfast - from 6:30 am, Have a nutritious and tasty start to your day with our a selection of teas, coffees, fruits, cereals, pastries, cheese, cooked meat. A savoury menu year-round - the hotel offers you a selection of seasonal ingredients that guarantee quality and freshness all year-round. Discover our many choices of meat and fish and give in to our daily specials. With 138 comfortable and well-equipped rooms, Campanile has everything to help you relax, move freely and work efficiently if you here on business. 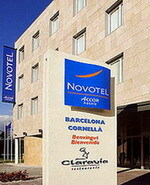 The Novotel Barcelona Cornella is located in a suburb of Barcelona, Spain, eight kilometres from the airport and nine kilometres from the city centre. Gaudi's Parc Guell is 14 kilometres from the hotel. This modern, air-conditioned three-storey property features bright, contemporary interiors. Multilingual staff are on hand 24 hours a day to arrange dry-cleaning services, exchange currency, and provide room service. Wireless Internet access is available in the Novotel Barcelona Cornella's public areas. The Novotel Barcelona Cornella's contemporary restaurant, Claravia, offers a range of traditional Mediterranean dishes, and includes a special children's menu. The Trencadis Cafe is open from 8 a.m. until midnight, and offers musical entertainment. The Novotel Barcelona Cornella's grounds feature an open-air swimming pool complete with a sun terrace. The hotel also offers a games room. Granollers - 20 kms away from Barcelona and close to Catalonia Race Track (Montmelo Racing Circuit) and the Vallromanes golf course. The Hotel Augusta Vallés features panoramic views over the eastern Vallés region, situated three kilometres from Granollers and 25 kilometres from the cosmopolitan city of Barcelona. Motorcycle and car racing enthusiasts are close to Circuit de Catalunya (Catalunya Track). Guests can relax with drinks in the hotel bar, unwind in the sauna or take a swim in one of the two swimming pools. In the restaurant, diners can choose from a refined menu of international dishes, served either in the stylish interior or on the terrace beside the swimming pool. Those guests feeling energetic can take advantage of the fully-equipped fitness centre. Complimentary wireless internet access is available for guests wishing to catch up on emails or surf the web. The hotel has a selection of meeting and conference facilities, accommodating up to 450 delegates and offers a range of audio-visual equipment and business services. 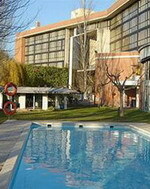 Hotel Ciutat de Granollers & Spa enjoys an accessible location only one kilometer from the centre of Granollers, Spain. Nearby attractions include La Roca Outlet Village, offering upscale brands and discount prices. Meanwhile, Circuit de Catalunya racing facility is located five kilometers away. Among its relaxing amenities, the hotel features both indoor and outdoor pools and a hydrotherapy area with saunas, spa tubs and steam baths. Moreover, a health and beauty area offers massage treatments, seaweed wraps and mud packs. The expansive fitness centre boasts a range of cardio and weight equipment. Meanwhile, the hotel's signature eatery, Ciutat Granollers Restaurant, utilizes fresh produce to create specialty Catalan entrees. The sunny restaurant features polished wood flooring, yellow walls and thick-framed paintings. 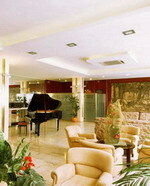 The hotel also offers a piano bar, featuring live music and specialty cocktails. Igualada - situated on the left bank of the River Noya, a right-hand tributary of the Llobregat, and at the northern terminus of the Igualada-Martorell-Barcelona railway. Igualada is the central market of a rich agricultural and wine-producing district. It consists of an old town with narrow and irregular streets and the remains of a fortress and ramparts, and a new town which possesses regular and spacious streets and many fine houses. 50 kms from Barcelona. 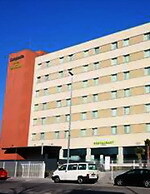 The Hotel Ciutat Igualada is located in Igualada, Spain, 100 metres from the Church of Santa Maria d'Igualada, 700 metres from the Convent of Sant Agusti, and seven kilometres from paper-making village, Capellades. It is 100 metres from Espana train station. A modern property, the Hotel Ciutat Igualada features avant-garde architecture and interior design. Amenities include a room service menu, complimentary Internet connections, and complimentary parking. The Ciutat Igulalada's contemporary Sal i Sucre restaurant serves Mediterranean dishes made with fresh, local produce. There are conference rooms and a business centre at the hotel. There are 66 guestrooms on seven storeys. Decor is contemporary, featuring warm greys and neutral tones, complemented by soft furnishings in muted colours. Martorell - 30 kms from Barcelona city centre. Scenic countryside, monuments and bridges.. culture and history. Martorell is the home of the SEAT automobile factory. The modern Hotel AC Martorell is located 500 metres from Martorell's central train station and only 30 kilometres from Barcelona. The Codorniu and Freixenet Wine Cellars are both within 13 kilometres of the hotel and Montserrat Monastery is 15 kilometres away. With its minimalist dark wood furniture the Kirin restaurant offers Mediterranean dishes with an oriental touch, using seasonal local produce and is open for breakfast, lunch and dinner. Guests can work out using the modern equipment at the hotel's onsite fitness centre. Complimentary newspapers are available in the lobby, where staff at the 24-hour front desk can provide information on local sightseeing hotspots as well as making restaurant reservations and booking excursions. 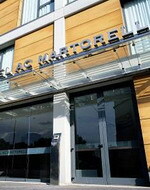 Business guests are well catered for with computer rental, the use of conference and meeting rooms and wireless Internet throughout the hotel. Mataró - the capital of the comarca of Maresme, in the province of Barcelona, Catalonia, Spain. 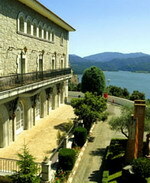 It is located by the Mediterranean Sea. 30 minutes drive from Barcelona. This emblematic Hotel is located five minutes away from the the commercial district, 300 meters from the beach and sports harbour and only 30 minutes from Barcelona. Its modern and functional decoration creates the feel of being in a different hotel. This establishment of superb quality offers all the comforts and services of a great hotel. The “Camí Ral” restaurant is located in a privileged zone in Mataró, on the ancient Vía Augusta of what was the Roman city of Iluro, just five minutes from the city center and the marina. Its modern and inviting décor makes it a great place to enjoy a market-fresh cuisine or a healthy buffet. Montmeló - home to the Circuit de Catalunya or Montmeló Racing Circuit. This premier sports installation has hosted numerous racing events, including prestigious Formula 1 races. The town was originally an agricultural community before industry took over. It also boasts excellent links with Barcelona enabling it to act as a commuter town of sorts. The Hotel Montmelo wishes to offer you the best service in a downtown quiet and familiar hotel which is suitable for both business and pleasure. From the Motorway AP-7 (France-Barcelona-France), take exit 13 (Granollers) and then follow up the signs to Montmelo. The Montmelo train station (5 minutes by foot from the hotel) connects to Barcelona downtown in 20 minutes. There is an 18 hole golf course in the area. 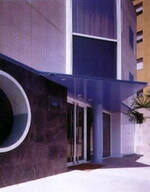 Sabadell - 20 kms from the Barcelona city centre and 30 kms from the airport. Sabadell is the capital of Valles Occidental, a powerful industrial and economic area in Catalunya. 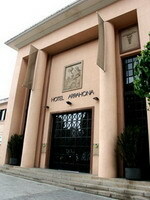 The Hotel Arrahona is housed in what used to be the Arrahona factory, which was completely redesigned in 2000 to become a hotel with guestrooms and self-catering apartments. 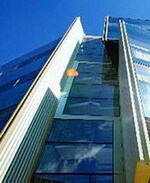 It is located in South Sabadell's commercial district, 700 metres from the train station. Guests of the hotel can enjoy a buffet breakfast in the cafeteria or relax with a hot or cold drink on the patio. Complimentary newspapers are available in the lobby and wireless Internet access is provided throughout the hotel. Staff at the 24-hour front desk can advise on local sights and attractions, safeguard valuables and provide laundry services. The 88 guestrooms have simple, modern decor with either dark or light oak-wood furniture and unique artwork. All rooms are equipped with direct-dial phones, cable/satellite televisions, wireless Internet connections and minibars. Bathrooms include handheld showers and complimentary toiletries. Founded in 1890, the Hotel Urpi is a family-run hotel, fully renovated in 2003 and set in the centre of Sabadell, 20 kilometres from the cosmopolitan city centre of Barcelona. Guests can dine on regional specialities in the elegant restaurant, relax over drinks in the hotel bar or order a light meal from the room service menu. Laptop users can catch up on emails or surf the web thanks to wireless Internet access in the public areas. The front desk has a safe-deposit box for storing valuables and the hotel offers secure parking facilities. With light decor in warm colours, the 130 guestrooms include air conditioning, desks, satellite TV, direct-dial phones, safes, Internet access and minibars. Marble bathrooms have hair dryers and makeup mirrors. Sant Cugat del Vallès - just 25 minutes from Barcelona city centre. Home of the famous Sant Cugat del Vallès Monastery and is a famous centre for sport training. This hotel is located in Sant Cugat, in the Can Sant Joan business area, and 25 minutes by train from the city centre (200 m from the station). This 4 star hotel is perfect for business and leisure travel. From breakfast to lunch, dinner or a tasty little snack, Novotel provides balanced choices and à la carte service 24/7 at all its hotels.At Novotel, you can count on enjoying a relaxing meal in a friendly, stylish setting. Claravia - Mediterranean cuisine with fresh products prepared in front of the client presenting traditional Spanish dishes with an original presentation. Enjoy a drink in the Art Deco bar. The hotel has room service. Spacious, contemporary in design, and adaptable, the Novotel room is truly a place for living, perfect for all your needs. 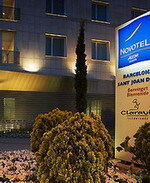 The Novotel Sant Joan Despí is located in Sant Joan Despí, Spain, three kilometres from Barcelona's Camp Nou football stadium and 10 kilometres south of central Barcelona. Distance to the nearest tram stop is 200 metres. Novotel Sant Joan Despí is a modern, seven-storey, smoke-free hotel with a seasonal outdoor swimming pool and patio area, where guests can relax and enjoy their meals. Mediterranean dishes are offered at the Restaurant Claravia, open for lunch and dinner, with indoor and terrace seating. Children's menus are available upon request. Drinks and snacks are served throughout the day at Bar Casting. Room service is offered during restaurant hours. The 161 air-conditioned guestrooms at Novotel Sant Joan Despí offer light, neutral decor with blue, patterned fabrics, and light- coloured wood furniture. Vic - the capital of the comarca of Osona, in the province of Barcelona, Catalonia, Spain. Located only 69 km from Barcelona and 60 km from Girona, this city is one of the most important of central Catalonia. Vilanova i la Geltrú - the capital of the comarca of Garraf, in the province of Barcelona, Catalonia, Spain. It is located by the coast, south of the river Llobregat. 47 kms from Barcelona City centre. The Atenea Park Suites & Apartments is a modern apartment complex located just 50 metres from the Blue Flag sandy beach in the relaxed seaside town of Vilanova i la Geltrú, one kilometre from the bars and restaurants of the port. The nearest airport is Barcelona, 40 kilometres away. 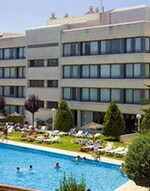 The hotel comprises three modern blocks surrounding a main pool, children's pool and sun terrace. There is also a small fitness room with treadmill and exercise bike. Business guests can make use of a conference room (this also doubles as a recreation area) with a large flatscreen television and Internet workstation (surcharge); free wireless Internet is available throughout the hotel. Each apartment block also has a self-service launderette (surcharge) with two washing machines and a dryer. Guests of the Atenea Park-Suites can dine on regional and Spanish dishes in the restaurant, open for breakfast lunch and dinner. In summer a bar opens by the poolside.